Myocastor coypus – the coypu. Britain’s largest rodent reaching up to a metre in length. It was imported from South America for the fur trade and, with the expected human incompetence, was allowed to escape. It established itself firmly in East Anglia, especially the Norfolk Broads, where it was regarded as a pest due to its habits of damaging river banks and over-grazing marsh plants. It has now been controlled. It would appear that the French had similar designs on the coypu, which they call le rigondin. Since the Marais Poitevin is a marshy wetland with many drainage channels and canals, it is another attractive habitat for good ol’ myocastor coypus where it seems particularly numerous. After a leg-loosening casual morning pedal followed by yet more leg-loosening over a vinous lunch, we leapt onto our bikes yet again to go and investigate Coulon, about ten miles away. Coulon is a slightly more touristy town and the excuse for our bike ride was a search for a Marais Poitevin sticker for Billy (he likes to have souvenirs of where he’s been). On the way into Coulon, we saw about half a dozen rigondins calmly grazing away in some drainage channels just a little way outside of Coulon. 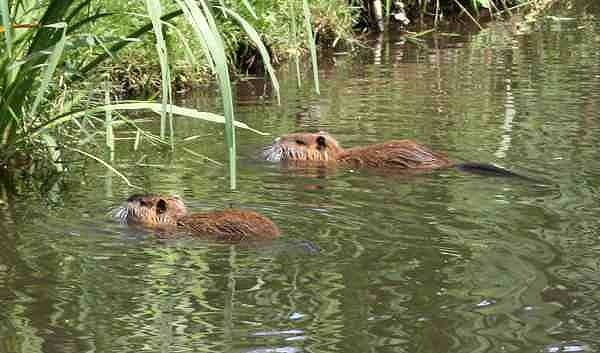 Demonstrating a typically Gallic approach to pest-control, not only did Carol find Billy a suitable sticker in one of the gift shops, she also found them selling pots of a couple of unusual appetizing local delicacies: rillettes de rigondin (potted coypu) and pâté de rigondin (coypu pate). Let’s not waste them, let’s eat them. We cycled back along a rigole, one of the larger canals, and saw many floating cages that were obviously traps for the unsuspecting rigondins. Fortunately, we didn’t see any containing captives. Maybe the critters aren’t quite so unsuspecting. We saw none anywhere near the traps, only in waterways where there were no traps. No, we haven’t tasted any. Very envious of all the wildlife & gourmand delights & glad you found a Wee-Fee point and avoided the pâté de rigondin. If flu permits, we’re off to Tuscany & catch you after that avec Les Eatons.